Three hundred years ago the famous scientist Isaac Newton calculated, from his studies of planets and the force of gravity, that the average density of the Earth is twice that of surface rocks and therefore that the Earth's interior must be composed of much denser material. CRUST --The thin, outermost layer of the earth is called the crust. It makes up only one percent of the earth's mass. This consists of the continents and ocean basins. The crust has varying thickness, ranging between 35-70 km thick in the continents and 5-10 km thick in the ocean basins. Within the crust, intricate patterns are created when rocks are redistributed and deposited in layers through the geologic processes. The crust is composed mainly of alumino-silicates. MANTLE -- The mantle is a dense, hot layer of semi-solid rock approximately 2,900 km thick and is composed mainly of ferro-magnesium silicates. This is where most of the internal heat of the Earth is located. .Large convective cells in the mantle circulate heat and may drive plate tectonic processes. CORE - Below the mantle is the core. It makes up nearly one third the mass of the earth. The Earth's core is actually made up of two distinct parts: a 2,200 km-thick liquid outer core and a 1,250 km-thick solid inner core. 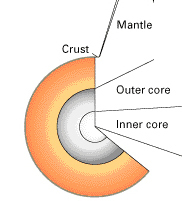 The outer core is made of iron and is very dense. As the Earth rotates, the liquid outer core spins, creating the Earth's magnetic field. The inner core is made of solid iron and nickel. Many scientists believe it is kept in the solid state because of the extreme pressure from the other layers. How do we know about the different layers of the earth? Information today comes from studies of the paths and characteristics of seismic waves from earthquake waves traveling through the Earth, as well as from laboratory experiments on surface minerals and rocks at high pressure and temperature and studies of the Earth's motions in the Solar System, its gravity and magnetic fields, and the flow of heat from inside the Earth. Timing and strength of seismic waves gives us a picture of the interior of the earth. Seismic waves gradually bend and change speed as the density of rock changes. What are the different types of Seismic Waves? Seismic waves are waves of energy that travel through the earth, for example as a result of an earthquake, explosion, or some other process that imparts low-frequency acoustic energy. Seismic wave studies have allowed scientists to construct a model of the earth's interior. There are two types of seismic waves, body wave and surface waves. The fastest wave, and therefore the first to arrive at a given location, is called the P wave. The P wave, or compressional wave, alternately compresses and expands material in the same direction it is traveling. Think of a slinky being compressed. P waves propagate through the Earth with a speed of about 15,000 miles per hour and are the first waves to cause vibration of a building. The S wave is slower than the P wave and arrives next, shaking the ground up and down and back and forth perpendicular to the direction it is traveling. S waves arrive next and cause a structure to vibrate from side to side. They are the most damaging waves, because buildings are more easily damaged from horizontal motion than from vertical motion. Surface waves follow the P and S waves. A surface wave is a seismic seismic wave that is trapped near the surface of the earth. Surface waves are analogous to water waves and travel along the Earth's surface. They travel slower than body waves. Because of their low frequency, long duration, and large amplitude, they can be the most destructive type of seismic wave. There are two types of surface waves: Rayleigh waves and Love waves. Surface waves -- sometimes called long waves, or simply L waves -- are responsible for most of the damage associated with earthquakes, because they cause the most intense vibrations. Surface waves stem from body waves that reach the surface. Energy that reaches the surface of the earth generates waves that travel outwar from the epicenter. These waves are call surface waves and move by giving particles an elliptical motion as well as a bak and froth swaying motion. These are the waves that cause most of the destruction from an earthquake. Love waves are surface waves that cause circular shearing of the ground. 3. What is most likely to occur when a cold air mass moves into a warm air mass? b) A warm front will form as cold air is forced upward. c) A cold front will form, as warm air is forced upward. d) there will be a sudden drop in air pressure on the ground. 4. What happens when the temperature of the air is lower than the dew point? 5. Which of these is not part of the Water Cycle?